ConstructRELIEF Selects First Wave of Homes for Hurricane Sandy Re-building Efforts . 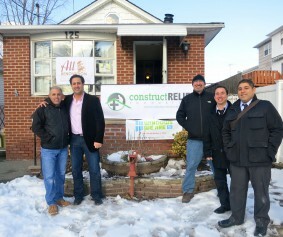 ConstructRELIEF Foundation held a press conference on February 12th at South Beach – Staten Island to announce the selection of five initial homes affected by Hurricane Sandy. Local Staten Island celebrities Angela Raiola aka “Big Ang”, Jennifer Graziano, and Jennifer Patafilo (of VH1’s Big Ang Show) will partner with ConstructRELIEF via the Big Ang’s Angels Organization to rebuild one of the homes selected. “These selected homes are a direct result of our initial fundraiser held in December – which raised $50,000.00 including $10,000.00 worth of gift card(s) donated by Home Depot, and over $100,000 in construction services” said Dominick Ciccarelli, ConstructRELIEF’s Co-Founder. The Martucci family has resided in their home for the last 37 years. Richard is a native Staten Islander who met his wife in 1960 while serving in the US Navy. Volunteers gutted the entire house days after the storm. We hope to have them back in their home to celebrate their 50th wedding anniversary later this year. The Todaro family immigrated to Staten Island from Italy in 1963 with their children. They have resided in South Beach for the last 49 years. They lost all of their possessions in the aftermath of Hurricane Sandy. ConstructRELIEF along with Big Ang’s Angels will partner on this project, to rebuild the Todaro home. Introduced by Staten Island Assemblywoman Nicole Malliotakis the Cianotta’s had not only endured significant damage to their home post Hurricane Sandy, but also the recent loss of their father. We are excited to be working with this family to restore their home back to its condition prior to the storm. Ms. Coto is a single mother raising two children including a special needs son. Most families were able to relocate temporarily during the rebuild process but due to her son’s needs they must stay in a familiar environment. ConstructRELIEF has partnered with the Verrazano Rotary to reconstruct a therapy / recreation room within the residence. ConstructRELIEF’s construction partners at All Renovation Construction LLC begin their first post-sandy rehab project in January at Breezy Point, NY. “We are working in conjunction with NYC’s Rapid Repair Program and a subcontracted plumbing and heating company to rehabilitate a single story home which was significantly damaged by sea water during Hurricane Sandy, ” said Robert Demertrio, All Renovation Construction, Partner. All Renovation Construction was referred to the homeowner after demolition and volunteers finished cleanup. The project took 4 weeks to complete and includes a full interior renovation. All Renovation donated the ceramic bathroom tile (approximately 250 sq. ft) and gave the homeowner a significant reduction in the total cost of the renovation project. “There is still significant visible damage in both Staten Island and Breezy Point, it’s our duty to help all our fellow residents in this time of need,” said Pietro Calabretta, All Renovation Construction, Partner. The initial homes announced today is part of a larger effort by ConstructRELIEF and it’s associated partners and industry volunteers to continue support for Staten Island residents affected by Hurricane Sandy. Families who want to be considered for ConstructRELIEF projects must submit a sponsorship application. Building and Design companies or construction industry professionals interested in volunteering or contributing materials are also directed to download and submit a donation application. Applications can be found at the Construct Relief website. Native Staten Islander’s Dominick Ciccarelli and Frank Martarella of Think Design Architecture founded the ConstructRELIEF Foundation. To view their work, please see their website www.thinkdesignarch.com. 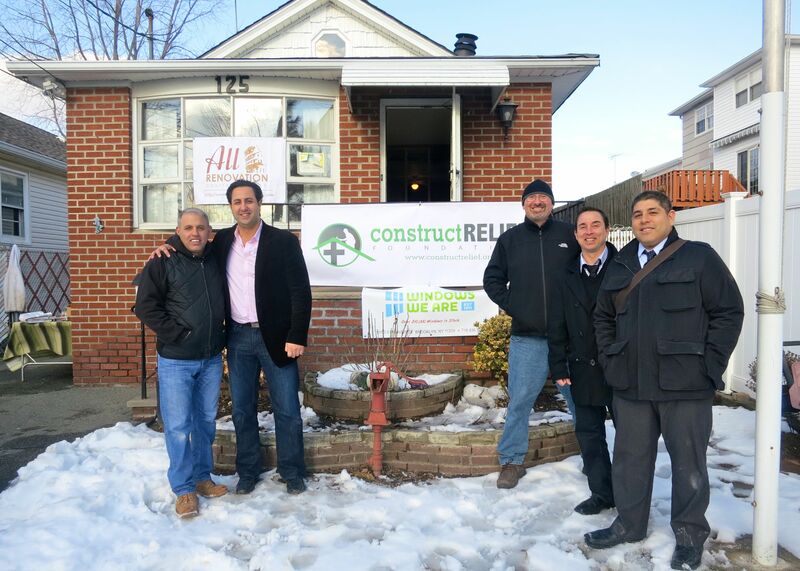 Additional founders of Construct Relief are the partners of All Renovation Construction LLC – a High End New York City firm that specializes in general contracting & construction management services. Pietro Calabretta and Robert Demetrio founded the company and recently added Allan F. Suarez as Partner / Chief Marketing Officer. To learn more about All Renovation Construction LLC please call (718) 351-4099, email info@allrenovationllc.com or www.allrenovationllc.com. To learn more about ConstructRELIEF Foundation partners, programs or special events, please call (718) 981-3335, email info@constructrelief.org or www.constructrelief.org. Up-to-date information will be available via our social media outlets including Facebook, Twitter, and Linkedin.